Tranzit need at least 29 coaches for RWC work - all need to be unbranded - ie white - they are the official team coaches, hence none of the new Scanias will be given a new livery until after the RWC. On another note the Newwmans brand is no longer used on coaches - Ritchies 556 is the latest to change from Newmans to Intercity. 556 - changed from Newmans to Intercity. Happy birthday for Saturday Scotty.... I would love to see the pics of the cake!!!! Spotted Go Bus 81 on school bus services this morning, first time I've seen an O.305 rebuild on school services for a very long time. Also can anyone confirm that Go Bus Hamilton have RT installed in the urban fleet? Can anyone confirm that both Tranzit 1036 and 1037 (2004 volvo B10M with Kiwi bodywork) both had or still have Grand Pacific Tours livery at some point in time??? Both had Grand Pacific livery - got photos of both in that livery - both now white - newer coaches on this tour circuit now - such as 1116, 1036/7 now white for RWC duties. Spotted a very interesting Tranzit liveried #1002 volvo B12FL yesterday on the Auckland - Wellington service in Hamilton yesterday. Will post photo soon. Yesterday I spotted 3 AOA buses on route 09 these were 180, 182 and 196..
Go Bus 564 MAN SL202 is partially covered in advertising for the ANZ bank... spotted on regular shuttle service between the Hamilton Tranport Centre and Field days this year. Baylines ex blue beach hopper, a Mitsubishi Rosa has recently been painted in an all white livery and is occaisonally seen on nakedbus service between Tauranga and Hamilton. Johnston's have gained the Pav's and Bayline Sector of the Naked Bus.Com Contract, Starting tomorrow Friday. Geeze there are new types of D/Ds are coming from everywhere Bustech have brought two prototype D/Ds out as there offerings and Denning have there D/D offerings and now New Zealand have jumped on the D/D band wagon who is next. Petenz wrote: The best I could get. 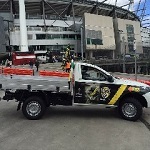 have you got a pic of the ADL next to it? Bedford-29 wrote: Geeze there are new types of D/Ds are coming from everywhere Bustech have brought two prototype D/Ds out as there offerings and Denning have there D/D offerings and now New Zealand have jumped on the D/D band wagon who is next. Yes very interesting indeed. I wonder if it will feature and the NSW bus show this coming August? 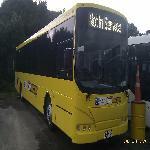 Also I believe this will be the second export to Australia for Kiwi Bus Builders after Mee's #15 Iveco? Johnstons 510 in Nakedbus livery, or wrapping, on Auckland to Wellington Tuesday morning, 1241 and 1248 also seen on services. Great pic.is it single door or two door? I guess this might be the Local version Demo Enviro 500 that rumours talk about? Johnstons 29, 503 and 511 now spotted in nakedbus livery. Anymore? Also spotted Reesby's 90 BCI tag on nakedbus service in Hamilton today. Spotted the relitively new Ritchies 302 on Intercity service in Hamilton today heading south. and SCL 29 which is the Tauraunga Based coach. Go Bus 24 and 219 were spotted on Charter in Hamilton today parked up at Caro St.
Its also interesting to note that the Hamilton City Council are planning bus parking for up to 6 coaches on Caro St. in a bid to see more tourist buses stop in Hamilton. Go Bus 79 was a rear sighting on route 9 Nawton yesterday afternoon, usually a diesel bus route.